Law career counselors have challenging jobs and are always on the lookout for a useful resource to help their students succeed. In spite of their efforts, retention rates for women in the law are dismal even though law career counselors work with promising students every day of the week. Susan Smith Blakely’s books provide a realistic overview of the challenges facing young lawyers as well as detailed guidance and solutions to empower students while supporting law career counselors as they fulfill their responsibilities. Monique is alarmed. As the director of a law school Career Services Office, she knows that many students graduate from law school only to abandon practice early in their legal career. 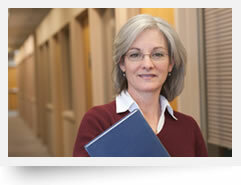 It is a big problem for the women lawyers especially, and it is a big problem for their law schools. Monique places students in jobs, and her Dean and the law school Board of Directors rely on her to do that job well. She knows that law school graduates can be effective goodwill ambassadors for the school, and that alumni are encouraged to provide clerkships and associate positions for current students and graduates. Monique also knows that the alumni only can provide these services if they stay in practices that continue to need new lawyers. It’s in the best interest of the law school to keep graduates employed, and Monique has a big part in making that happen. Law school rankings and the school’s reputation rely on good graduate employment statistics, and Monique feels a lot of pressure to maintain good numbers for the school. Monique also knows that the law school depends on the contributions of alumni, and alumni, who have left practice, are less likely to be donors. 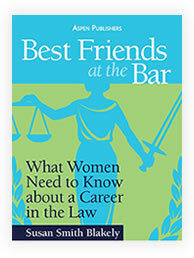 When Monique read about Best Friends at the Bar: What Women Need to Know about a Career in the Law and the new books in legal magazines and on legal blogs, she promptly ordered the books. 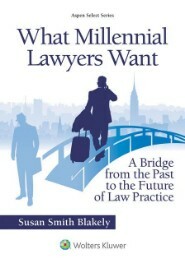 The author, Susan Smith Blakely, emphasized how important it is for young lawyers to remain in the profession and find ways to create work-life balance. Monique agreed and liked the theme of making good choices and developing good career plans early in practice, even as early as law school. She especially liked the sage advice from more than 70 lawyers and judges and the fascinating profiles of lawyers in transition. 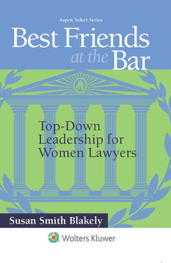 The books are a great resource for her law students who need to develop realistic views of law practice and the special challenges women face in a male-dominated profession. Ms. Blakely does not judge personal decisions or push personal agendas, and she even includes information on re-entry after a break that sometimes is necessary for personal reasons. Re-entry challenges are a big impediment to women lawyers who have to step out of the practice for a while, and Monique knows from counseling alumni how important this information is. Feeling encouraged and enthusiastic, Monique asked for her Dean’s support to develop a special program for young law students. She invited Susan Blakely to speak at the school and encouraged alumni to attend. Susan was a very engaging speaker, and Monique appreciated her efforts to reach out to the students and inspire them to take charge of their own careers. Susan challenged the students to create their own personal definitions of success and to have reasonable career expectations. Monique knows that it is so important for young lawyers to stay in their chosen profession even though it can be challenging. Monique was gratified when the students engaged Susan in animated Q & A after her talk and eagerly purchased books. She could tell from the applause that making Best Friends at the Bar part of the law school experience was a win/win for the students and for the school. Contact Susan to discuss speaking at your event and bringing the message of empowerment in Best Friend at the Bar to your pre-law and law students. 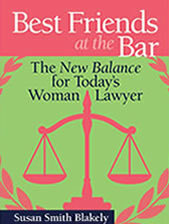 If you would like to purchase wholesale copies of the Best Friends at the Bar books for your school you can find more information on the Aspen Publishers’ website.